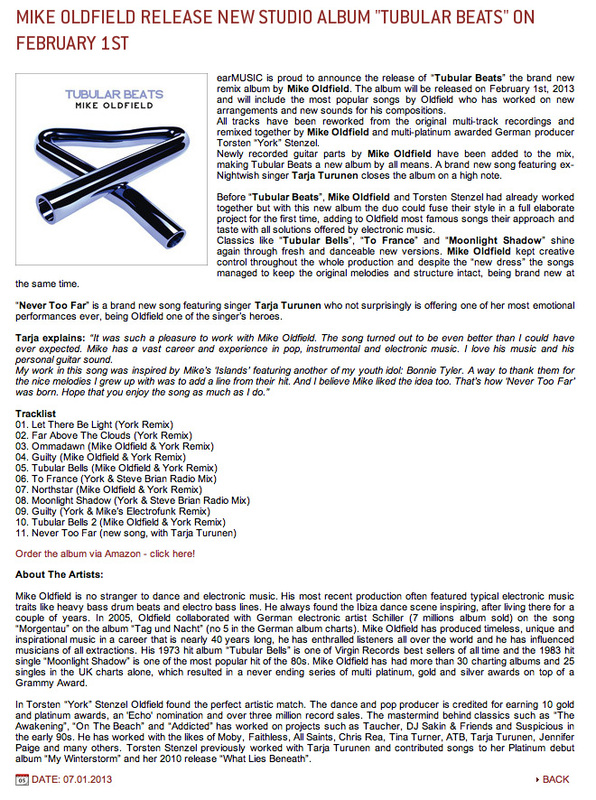 earMUSIC is proud to announce the release of “Tubular Beats” the brand new remix album by Mike Oldfield. The album will be released on February 1st, 2013 and will include the most popular songs by Oldfield who has worked on new arrangements and new sounds for his compositions. All tracks have been reworked from the original multi-track recordings and remixed together by Mike Oldfield and multi-platinum awarded German producer Torsten “York” Stenzel. Newly recorded guitar parts by Mike Oldfield have been added to the mix, making Tubular Beats a new album by all means. A brand new song featuring ex-Nightwish singer Tarja Turunen closes the album on a high note. Before “Tubular Beats”, Mike Oldfield and Torsten Stenzel had already worked together but with this new album the duo could fuse their style in a full elaborate project for the first time, adding to Oldfield most famous songs their approach and taste with all solutions offered by electronic music. Classics like “Tubular Bells”, “To France” and “Moonlight Shadow” shine again through fresh and danceable new versions. Mike Oldfield kept creative control throughout the whole production and despite the “new dress” the songs managed to keep the original melodies and structure intact, being brand new at the same time. “Never Too Far” is a brand new song featuring singer Tarja Turunen who not surprisingly is offering one of her most emotional performances ever, being Oldfield one of the singer’s heroes. Tarja explains: “It was such a pleasure to work with Mike Oldfield. The song turned out to be even better than I could have ever expected. Mike has a vast career and experience in pop, instrumental and electronic music. I love his music and his personal guitar sound. Order the album via Amazon - click here! Mike Oldfield is no stranger to dance and electronic music. His most recent production often featured typical electronic music traits like heavy bass drum beats and electro bass lines. He always found the Ibiza dance scene inspiring, after living there for a couple of years. In 2005, Oldfield collaborated with German electronic artist Schiller (7 millions album sold) on the song “Morgentau” on the album “Tag und Nacht” (no 5 in the German album charts). Mike Oldfield has produced timeless, unique and inspirational music in a career that is nearly 40 years long, he has enthralled listeners all over the world and he has influenced musicians of all extractions. His 1973 hit album “Tubular Bells” is one of Virgin Records best sellers of all time and the 1983 hit single “Moonlight Shadow” is one of the most popular hit of the 80s. Mike Oldfield has had more than 30 charting albums and 25 singles in the UK charts alone, which resulted in a never ending series of multi platinum, gold and silver awards on top of a Grammy Award. In Torsten “York” Stenzel Oldfield found the perfect artistic match. The dance and pop producer is credited for earning 10 gold and platinum awards, an 'Echo' nomination and over three million record sales. The mastermind behind classics such as “The Awakening”, “On The Beach” and “Addicted” has worked on projects such as Taucher, DJ Sakin & Friends and Suspicious in the early 90s. He has worked with the likes of Moby, Faithless, All Saints, Chris Rea, Tina Turner, ATB, Tarja Turunen, Jennifer Paige and many others. Torsten Stenzel previously worked with Tarja Turunen and contributed songs to her Platinum debut album “My Winterstorm” and her 2010 release “What Lies Beneath”.